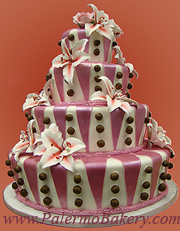 Brides are breaking away from the traditional white wedding cake and choosing wedding cakes of various colors. So why pink? Pink sends a message of romance, sweetness and femininity; it is a soft color and is just "pretty." There are many shades of pink, from almost white with just a hint of pink to brash and sassy "hot pink." If you love the color, go for it! 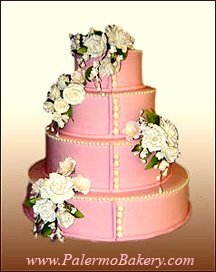 You can have an all pink creation as shown above with white roses randomly adorning the tiers. This bride had a button down dress and decided to add the button dots on her cake to have it coordinate with her dress. The idea was a hit at the reception and gave other brides ideas as to how they could be creative with their wedding cakes. This creation is so beautiful, ever so delicate and feminine. It's white, fondant covered layers with alternating white pearls and pink ribbon decorating the bottom of each tier is magnificent by itself. 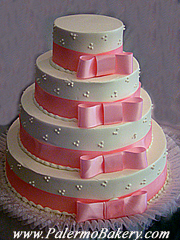 By adding the pink fondant bow with a rhinestone embellishment is, as they say, "icing on the cake." This confectioner's delight sits on a ruffled doily adding an extra layer of charm and grace. 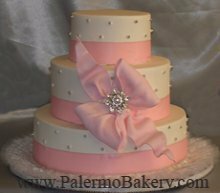 This four tier, round, white fondant cake with soft pink ribbon and bow lining the bottom of each layer is sweet and enchanting. The little triangular white dots help keep this baker's delight both delicate and yummy to look at. This magnificent, four tier pearled vertical hot pink, triangular stripes cake will work well for a fun loving, modern couple. There are three brown fondant balls in between each stripe. Gracefully placed gum paste lilies give this cake a lovely finishing touch. 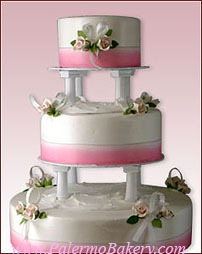 This three tier round, butter cream cake is elegantly decorated with pink ribbon at the base of each tier. Strategically placed on each tier are tiny rosettes with white ribbon, giving this creation a very sweet sense. Additionally, the white columns that separate each tier brings you back in time with this traditional looking cake. Take a look at Wedding Cake Ideas for more ideas and tips on how to choose the right size cake, baker, flavor and style for your wedding cake. There are dozens of alternatives for toppers to choose from. I have selected a few that you may want to use with your pink cake. 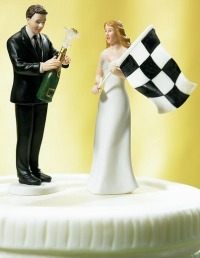 If you're choosing a modern or whimsical cake consider this happy couple celebrating at the finish line. This happy bride is waiving her flag while the hubby pops open a bottle of champagne. And the party begins! This modern Indian Couple has the bride wearing a sari with henna and bindi, is paired with a groom in a traditional black suite. This bride waving to her hubby is adorable as the husband is reaching to help his new gorgeous bride. These porcelain figurines are made with incredible detail. Mix and match with other novelty interchangeable cake toppers! 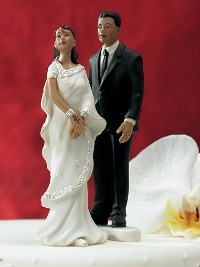 This traditional cake topper screams LOVE. It is embellished with Swarovski crystals. Each figurine can be sold separately and paired as you wish. All of the above toppers can be found at Best Bridal Prices. 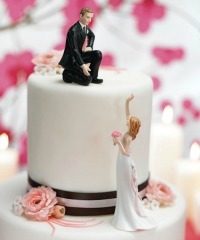 Click on the link below and browse all of their magnificent cake toppers for pink wedding cakes. Your wedding day is becoming a reality and I hope my pink wedding cakes tips and ideas help to inspire you to create your dream wedding cake. 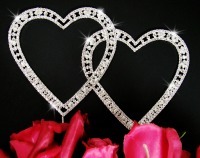 Check out some great wedding ideas.